Leimasin on Penny Blackin, väritykset vesivärein ja tuhosin vanhoja paperivarastoja. Postauksen lopussa on 10. juhlavuoden tammikuun voittaja. colouring with watercolours and tried to use my old paper pads (mostly BG). I don't yoga yet, but this orange-black "thing" is in use! I do water gym once every week. Leikkaan kortit 10.s juhlavuosi, seuraa blogia, osallistu kilpailuihin, kommentoi postauksia - kaikenlaisia yllätyksiä tulossa pitkin vuotta aina syyskuulle asti! 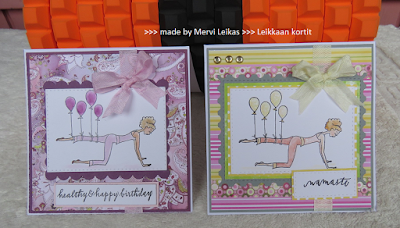 This is the 10th year here at the Leikkaan cards and crafts blog, big celebration, so follow, comment the postings and entry my challenges. There will be surprises all over the year until the big event at fall. January's winner is Pia S; I'll send you a little gift next week. Todella kauniit paperit ja ihanat leimakuvat! A great set of cards, Mervi. 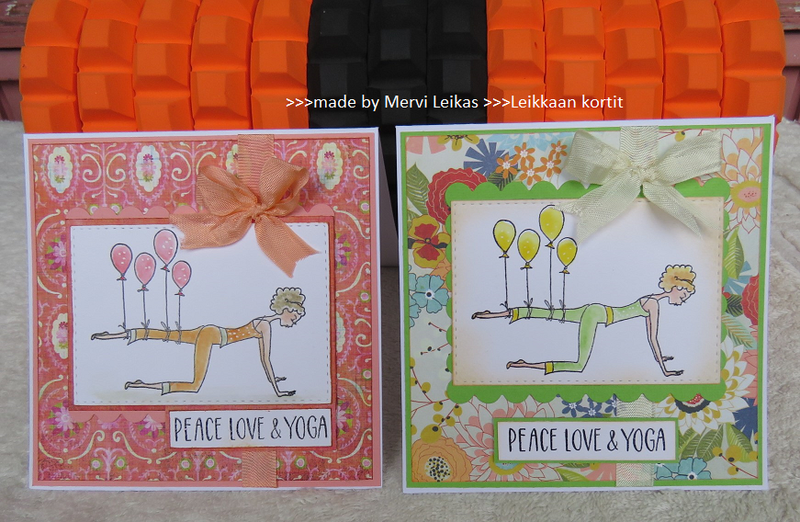 Fabulous "Yoga" image - love it ! Thanks for joining our "Birthday Balloon" Challenge @ Little Red Wagon. Hope to see you back again soon. 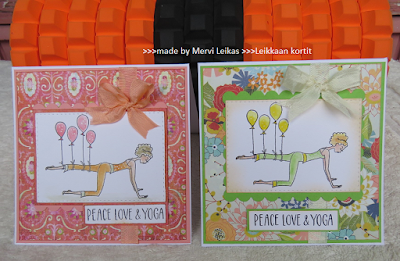 Wonderful set of cards!Very creative!Thank you for sharing with us at the Crafty Gals Corner this week!Hope you join us again soon! These look so great in all of the different color combos. I would definitely need balloons to do this! Thank you for joining us at Gals Corner for our Anything Goes challenge.